The other day I was listening to the radio while driving into town. The DJ on our local Christian radio station made a comment that really stuck with me. He said, "Don't compare someone else's highlight reel with your behind the scenes footage." I have to confess with all the wonderful blogs and decorating ideas available on the internet, I sometimes get caught up in the appearance of someone's kitchen or their family room or a great patio area. It's hard not to look up from the computer screen and be content with what I see before me...less than shiny windows, dust on the ceiling fan, shoes carelessly left in the floor of the living room, personal belongings laying on the couch, forgotten projects once begun with motivation now sitting lackluster half finished. I know the houses I see online are not always photo perfect. But, without seeing their behind the scenes footage and ALWAYS seeing mine, it's easy to forget and unfairly compare those photos to my own home. I love my house. It's not perfect. The floorplan is terrible but it works for us...for now. The dining room/office/craft room. This room had a pretty thorough purging a few weeks ago. There are still projects sitting around, Etsy items for my store, dishes from my Spring decorating waiting to find an off-season home. I'm hoping to turn this room into a library for my younger two girls that are still homeschooling. We've always done most of our school at the kitchen table. The kitchen...unusually free of dishes in the sink. (Two of my three daughters have been away this week. I can't believe how few dishes we've used with two less people in the house.) Lots of things sitting out on the counters. I'd prefer they were put away but, truth be told, it's just more convenient when they are out. Lastly, the kitchen table. The catch-all, do-all center of our home. Just a few hours earlier, it was covered with my youngest's items for her trip, a bunch of paint and brushes from the painting I was doing. Now there's just my purse, Sonic cup, and a 1X12 plank that I hope to someday use to replace the top of this table. Another project awaiting its turn. So, there you have it. Just an ordinary day, no special props or staging. It's neither a page from a magazine nor is it pristine or spotless. Now, I'm in no way saying that there is anything wrong with a picture perfect house. I think it's what we all strive for. I just wanted to remind us all that we have homes that we live in day in and day out...normal looking, lived in homes. Don't defeat yourself like I have done by comparing your home to those in the glossy pages of a magazine. Thanks for taking time from your busy life to visit me. God bless! My oldest daughter and I ventured over to Nolensville, Tennessee, last week. Nolensville is a quaint little town outside of Nashville that offers some terrific antique stores and small diners. There were two stores that really caught my eye. The first, The Roost, was full of some rusty, crusty goodness. The second was vintage and hip and I'll post about it later. Here is The Roost. Just look what's outside! Shutters, washtubs, and planters...Oh My! Look! Do you see all of that rusty, chippy, concrete GOODNESS?! I could hardly contain myself. But, I had to. We were on our way to a bridal shower nearby so no digging through those treasure piles for me that day. Soon though! Inside The Roost did not disappoint either. Booths filled with vintage and antique finds. Wonderful displays and more. Adorable lampshade frame and I REALLY want one of those fireplace mantels! There was so much more I could have photographed but I was really too busy shopping and drooling. 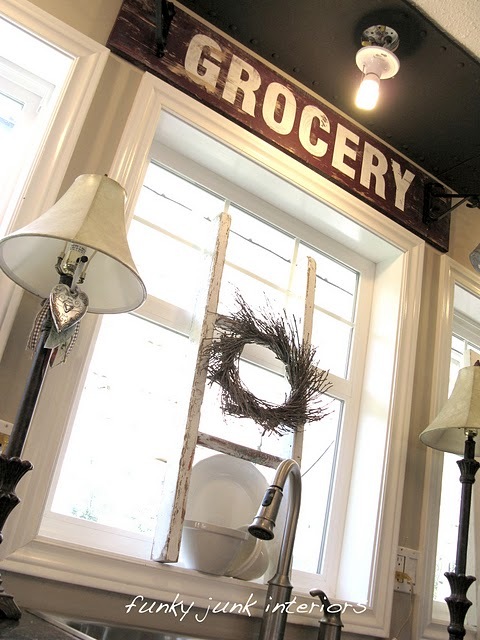 If you get a chance to visit Nolensville, be sure to stop at The Roost. Until then, you can visit their blog here! Thanks for taking time to visit my blog! Well, I'm trying a new look for The Altered Past blog. Unfortunately, I'm not very savvy in blog design. I like the new background but not the layout. Please stick with me while I tinker with the layout. I really should sign up for Blissdom and Haven so I can learn great blogging techniques from the experts. If you are one of the lucky ones that got your ticket to Haven this month, enjoy!! I waited too late. Maybe I'll see you there next year! 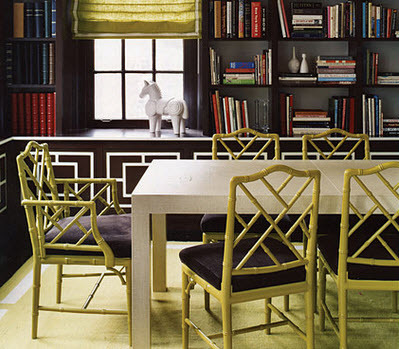 Bamboo chairs seem to be a classic when it comes to decor. I've always loved the look of bamboo, especially when it's aged and has a rich, dark patina. Most bamboo chairs I see today, however, are painted bright, fun colors. 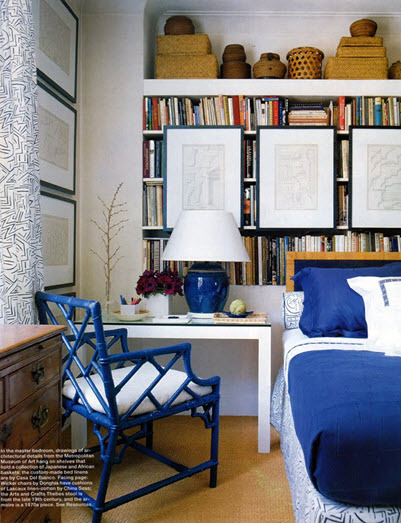 Great blue accent with the white and the natural tone of the baskets and chest. So I guess you could say I was pretty excited when I stopped at a yard sale and discovered a set of 4 bamboo chairs. The price was $30 for the set (and I really had no idea what a real bamboo chair would sell for...more on that in a moment)! Hello! Yes, I'll take them...right now. Like, before anyone else discovers my treasure. At the time, I drove a small SUV. Have you ever found a piece of furniture, a treasure, I mean, a real NUGGET and you just had to get it home with you right then? Someway, somehow? Yeah, that was me. I know the lady helping me load them thought I was suffering from some delusion because she finally gave up on my trying to fit the puzzle pieces together so that every chair would fit into my should-be-a-moving-van-but-it's-capacity-challenged vehicle. She said, "Have a good day" and went inside. I don't think I'm alone when I say (as a thrifter, yard saling bargain hunter) "where there's a will, there's a way!" And I definitely had the will to get those babies home right then. And, I did. I know you know what I'm talking about. It's even funnier when there's a man trying to help a determined woman get the treasure in or on her vehicle, lol! That's another post and another thrifting find. So, here's a couple of the beauties. The seat is actually a cream colored fabric. I just tucked this black/white pillow sham around the seat because we had been using the chair at the kitchen table. This one is at the end of the kitchen table. I added the pillow because I liked the way the natural wood and fabrics look together. It's a linen covered pillow with a burlap cuff around the middle. And, here it is with the original seat covering and wood color. I don't think I can bring myself to paint them. Change the seat cover but paint them?! Do you see that??!! That was each! Of course, once I got home and told my hubby, his comment was "sell them, sell them!" I was pleading "no, I'll never, ever have chairs like this again...ever!" Hahaha...I'm sure I sounded like one of my girls in their pre-teen years. Never, ever! These are the last ones on the planet! Ok, maybe it wasn't that dramatic but I was pretty excited. Another great surprise...they were custom made locally! I'm linking this post to Miss Mustard Seed's Furniture Feature Friday, Debra's blog at Common Ground here. And, Beyond the Picket Fence here. Be sure to check out these sites for more GREAT ideas! They're some of my favorites! Thanks for taking precious time out of your day to visit with me! 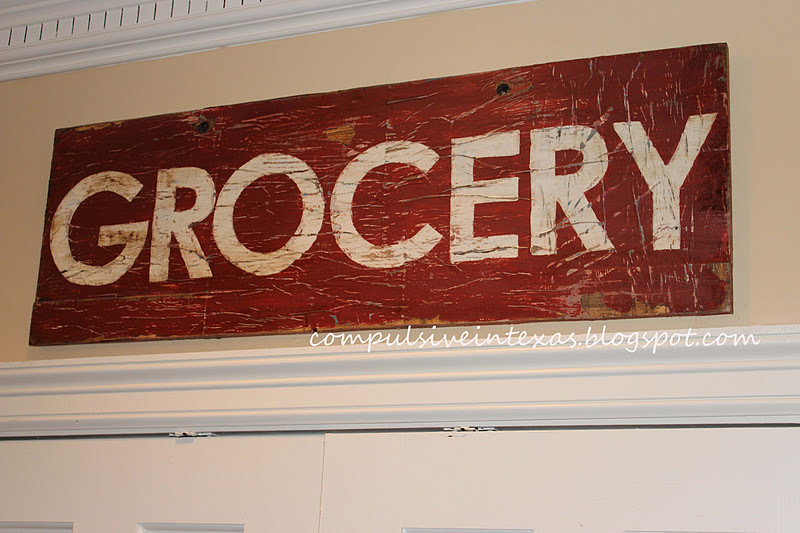 I've seen some great vintage signs all over blogland. I've had sign envy so what's a girl to do but make one, of course. I found a piece of board that my hubby had previously used as a shelf in his garage. It had lots of nice dings, nicks, and holes already in it. I wanted a nice, pale shade of apple green to match my kitchen but I also wanted it to appear that the paint had oxidized with age. A light touch of flat white paint over top gave me what I was looking for. A light sanding didn't hurt either. 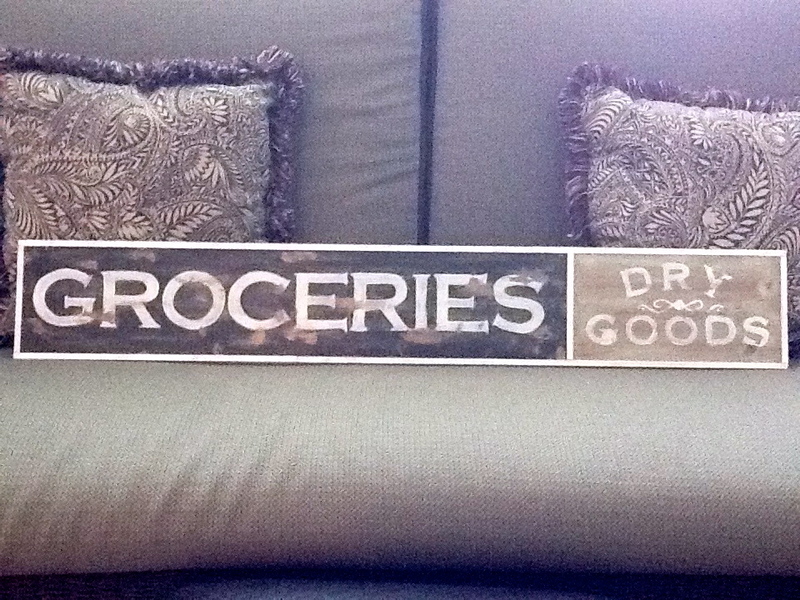 I hung the sign above a Pottery Barn bookshelf for now. The bookshelf is standing in for the perfect hutch that will one day replace it. The bookshelf is great for plates but I would prefer something a little heftier (is that a word?) for this spot. I painted the letters freehand because I'm too impatient to do most things right...like printing them and tracing them. See, I really need a bigger piece of furniture here. I've got the perfect piece in mind. I've just got to wait for it to pop up on Craigslist! If you've read any of my earlier posts, you'll notice my kitchen looks quite different from the dark, red walls I had a year ago. More on the kitchen re-do later! We had a perfect day today in Middle Tennessee. I hope you had a great day too!